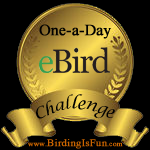 :: The American Birding Association has launched “Birder’s Marketplace“! :: From Nicholas at Hipster Birders: Thrushed with Excitement in Forsyth Park! :: Rare Bird Alert in Canada: A Garganey (Code 4) has been found around Mirabel, Laurentides, Quebec. :: A pair of Peregrine Falcons at the Bell Tower in Edmonton, Alberta, have laid three eggs, and the Alberta Conservation Association has put up a cam so you can watch the pair via live streaming. :: From Landon at Two Birders and Binoculars: Where do Birds Sleep? :: From Sharon, beat writer for 10,000 Birds: How Close is “Too Close” to an Owl?